Where in the world is LadyFIRE? I've been pretty silent around here but I've almost locked down that promotion I've been chasing. I have a verbal confirmation, but I'm not popping the champagne till I get the paperwork, and the payrise. Still, it means I've been crazy busy and barely sparing a thought for this blog. It creeps into my head as I'm falling asleep each night, but during the daylight hours there's just no time. But I can keep up these monthly reports, for your curiosity and my ongoing benefit. It gives me a little thrill each time I sit back and look at how well I'm tracking towards these goals. To reach Financial Independence, Retire Early, and not have to go to work on a Monday ever again I need lots of money. More importantly I need money that produces more money. Right now I spend between $25,000 and $30,000 a year. This doesn't include the maintenance costs on my investment property, because that is covered by the rent. So if I wanted to walk out of work and never come back again, I need to find a way to make $25,000 a year, without a regular paycheck. I'd rather go for the higher end of the scale though, so to fund my $30,000 lifestyle in retirement, I'm going to need to find $750,000 in the next eight and a half years, in accordance with the four percent rule. 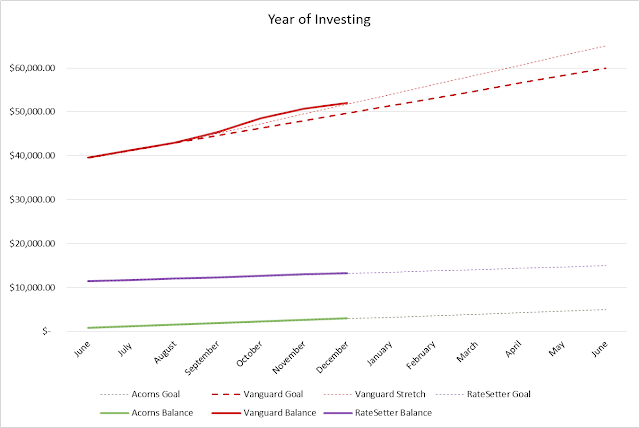 For the next twelve months (July 2017 - June 2018) I am going to focus on supercharging my investments. The earlier in my retirement journey I start investing the more heavy lifting will be done by compound interest. By spending my money on buying more money in the early years, I hope to see my investments growing on their own through the next few years. 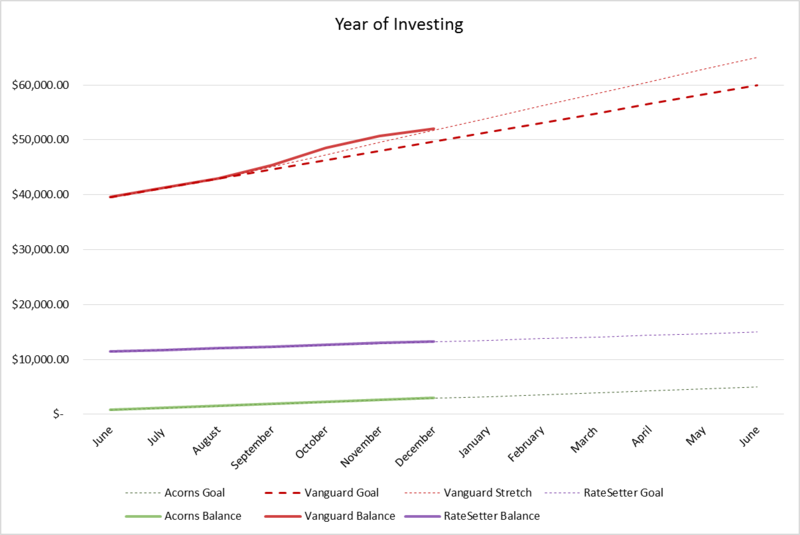 In the Year of Investing I plan on building up my existing accounts until I have just over 10% of my retirement fund. Starting from $52,000 I'm aiming for $80,000 by July 1 2018, an increase of $28,000 - just shy of $2,400 a month. Want to try out Acorns? Check out my review first. There's really nothing exciting to say here. Money in, tiny bit of dividends, little bit of market growth. On track for the years goal. 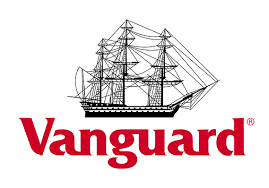 Want to try out Vanguard? Check out my review first. This is the second month in a row that I haven't had to deposit any extra because the markets are running along so nicely. The final market return for December is much less than I thought, but I'm still tracking ahead of the goal thanks to some nice growth. January will have dividends too! Want to try out RateSetter? Check out my review first. Still chasing that elusive $100 in a month. I realised that I was failing to considering RateSetters cut when calculating my monthly returns, so that's why I've always been under. On one hand it's easy to get cranky when they're taking away your income, but remembering that RateSetter has returned over 8% every year since I started, I really can't complain. 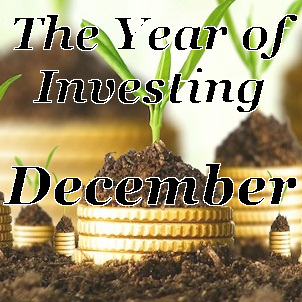 In total I'm hoping to invest $23,000 during the Year of Investing. On top of that I plan to keep up with my mortgage repayments, which should see my debts drop by approximately $12,500. This means saving $35,500, just shy of 50% of my income. So on top of paying down my mortgage and investing, I plan to squirrel away a little bit more so I can declare that I saved 50% of my income. In the previous 12 months I saved 41% of my income, so this year I though 'What the heck, let's push for 50%'. Ahh, here it is, the correction! 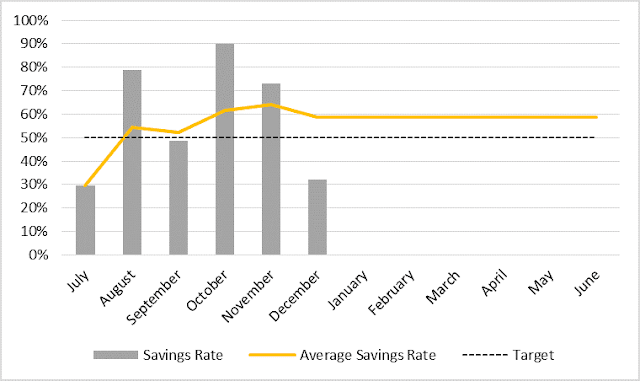 Finally a month under 50% savings. It's actually all from Novembers spending, with a bunch of bills being paid on my credit card. I'm a huge fan of credit cards, as long as they are paid in full every month. Carrying a credit card balance is the worst kind of stupid. If you can't afford it, don't buy it. For the sake of curiosity, here's what I spent in December. Just once little bill for the gas, but I also had my first pest inspection in three years. Oops, but we have a clear bill of health, so woohoo! Just the mortgage again. Phew. This can't last though. Let's be honest, I'm cheating a little. I've been on leave for a week and not near shops. My partner has been, and he's been picking up the essentials. Men are the best. Not a particularly exciting month - I needed to stock up on chicken feed which is pricey, but lasts roughly three months. Once again, my partner picked up the tab for the cat food, phew. It's the off season! Finally a free month. January will be expensive though, January's always are. Nothing! Forgot to plan that Christmas road trip. It's now been over a year since I spent any money on (non-derby) travel. Another super cheap month! With more than 50% of my spending being the interest on my mortgages I think I am allowed to give myself a 'super frugal' award. It's pretty exciting to know I can live this comfortable lifestyle on so little money. It makes the FIREy future look bright indeed! What I like is that what you're doing is very well documented and not too much of a long (boring) story like we can read sometimes with other bloggers. 50% savings rate is... awesome ! Congrats!